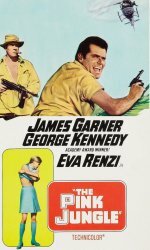 James Garner plays a fashion photographer who is stranded in the South American jungle with model Eva Renzi when George Kennedy steals their helicopter in his quest to locate a hidden diamond mine. Blending elements from North by Northwest, The Maltese Falcon" and King Solomon's Mines, this is a jolly caper that manages to be tense and spoofish at the same time. Garner is his usual charming, laconic self, while Kennedy, who plays everything for laughs, is very amusing.